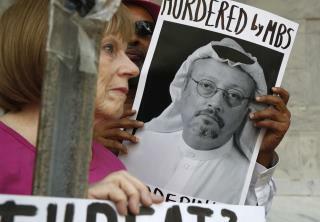 (Newser) – Turkish officials say they have audio and video evidence proving that journalist Jamal Khashoggi was tortured and murdered inside Saudi Arabia's Istanbul consulate. The officials, speaking under condition of anonymity, tell the Washington Post that the audio evidence is extremely graphic. "The voice recording from inside the embassy lays out what happened to Jamal after he entered," one source says. "You can hear how he was interrogated, tortured, and then murdered." Sources tell the Wall Street Journal that Turkish officials have shared the evidence with their American counterparts and are discussing how and when it should be publicly released. The Post's sources say officials are worried that releasing the recording will reveal that they spy on foreign consulates. The big problem with this whole ugly business is that Erdogen has most of Turkey's journalists imprisoned and I've heard no mention of it from anyone , plus the way Turkey is behaving with their spying with cameras and audio in the Saudi Embassy . Probably the same going on in every other embassy and their people are going to be busy dismantling their buildings looking for the evidence . Erdogen is an Islamist dictator who has locked up anyone who disagrees with him , their supposed free and fair elections ?I'm sure they know which side every single person voted for . Well, they didn't teach stuff like this in journalism school. Contract to be taken out. The only thing in this 21st-century so-called civilized nations can do - only watching when people are murdered in coldblooded? These tribal barbarian vultures should be taught and told in no uncertain terms where to get off!